Do you want to reveal the hidden password on some sites? Well, check this list of the best tools to show hidden passwords. Revealing the password that is hidden under the asterisks is very useful not only to remember it but also to detect writing errors when we enter it. The vast majority of online services no longer allow the entry of passwords discovered for security reasons, but the user has a couple of tricks in their favor. The most effective way to control any incident related to passwords is to adopt an administrator. I use KeePass, since it is an offline tool (no clouds for my passwords, thanks), open source (with a substantial presence in other platforms beyond Windows) and audited by the European Commission. Now, I understand that many users don’t want to install another program when they already have problems dealing with passwords on their own, but when using a manager, you should only remember one. The alternative is to let the browser save them. Greater comfort for the user with a higher associated risk, and if you forget them, all you will see in the boxes will be asterisks, unless you some of the best tools to show hidden passwords. Asterisk Key is one of the best tools to show hidden passwords on textboxes. The app, once it has been started, scans the form in search of the textbox with the typical “*******” and gives you the content of the password. Asterisk Key is free to download. Above you have an example of its use. I have created a small app with a TextBox and a password, and then you can see how Asterisk Key returns the internal text of the TextBox. This tool to show hidden passwords isn’t as powerful as the previous one but it can also serve you in certain moments, and it is also very portable since you only need its executable. This works in another way, you have to pass the mouse pointer through the textbox with the asterisks, and automatically if the app can (due to the security of the app), it will return the text under the asterisks. From the web of ShowPassword, you can download the app for free. On the site you will also find another app Storage Viewer, it is fascinating, but it is paid. 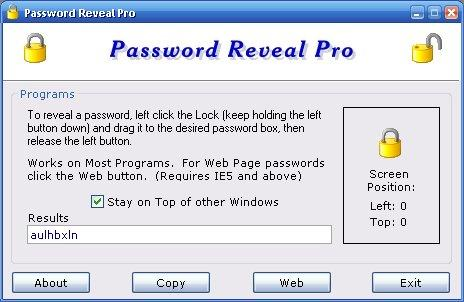 Password Reveal Pro is very similar to ShowPassword but with the inconvenience that is paid. You can download a Trial version, which serves in the same way for your purpose. A padlock appears on the right side of the application. You select it and drag it to the textbox, and then the text will appear in the app. In the web of Password Reveal, you can download the app. When the password to access a site in the browser has been saved, and you want to enter your account, you will see how when informing the user, the browser quickly loads in the corresponding field the passwords hidden under asterisks. But if you don’t remember that password and you want to configure the account in another PC, you will have to use some tool or access the browser configuration to recover the password and not have to perform the password recovery process that facilitates the service in question. However, there is a little trick that allows you to see the text of this password quickly and easily without having to do anything of all this. To do this, you have to place the cursor in the password field where the asterisks are displayed and click with the right mouse button. Next, choose the option Inspect from the contextual menu, and this will open the debug view or browser developer that you are using at that moment. There you will be able to see the source code of the web page in execution with the code that corresponds to the field where the password is shown with asterisks. Although you don’t have any knowledge in HTML, you must locate in that line where it puts input type=”password” and replace the word password with text. In this way, automatically the password field will become a field of text type and will stop hiding the password behind the famous asterisks and can see it without any problem. Don’t worry because the next you enter that page shows the password, anyone can’t see it since the source code of the page isn’t modified and once the page is reloaded the password field is returned with asterisks. Passwords serve to protect your accounts and data. It is a fundamental aspect to avoid intruders both in your Wi-Fi network and in any service you use. However, sometimes it can be difficult to write them without making mistakes especially when you are using keys that are very long and complex, which on the other hand is recommended. You already know that when you type a password in the browser to access any account, asterisks appear to protect it and that nobody sees it. Sometimes it is not easy to write a password correctly. You already saw that even Facebook would allow entering the account without writing the key correctly. Maybe you put a number wrong, a letter, some capital. Sometimes you press two keys at the same time, and you don’t know for sure if you have done it or not. This is what causes you to have to erase the password and have to retype it in Google Chrome. For example when logging into a social network or any page. But there is a solution. You can reveal passwords by putting them in Google Chrome. In this way, you avoid the asterisks to come out. For this, you can use an extension for Google Chrome. 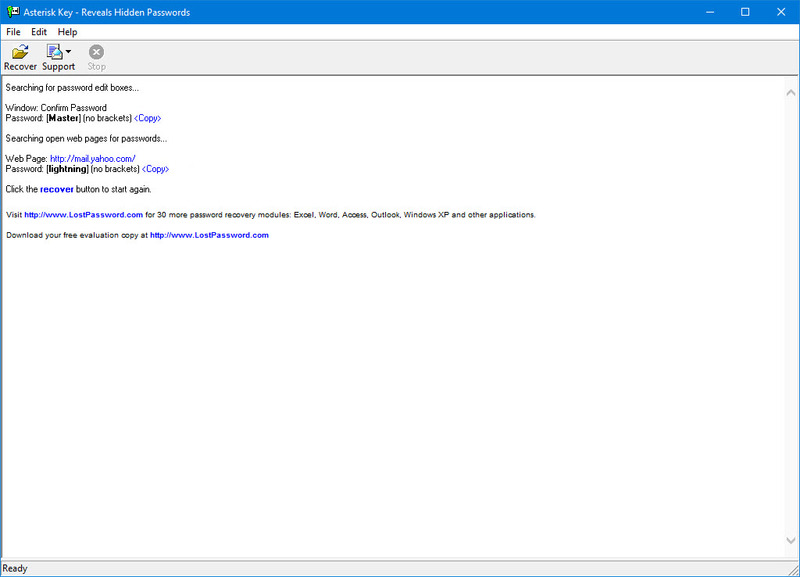 It is called ShowPassword, and its sole purpose is what its name says: show hidden password. Avoid appearing asterisks when you are writing a key in the browser, a way to facilitate the task when you write a long and complex password, and you don’t want to make mistakes and have to start from scratch. Of course, your security and privacy may decrease. Keep in mind that anyone next to you will have visual access to that key. It is not advisable to use this extension if, for example, you are going to open the computer in a common place where there may be people nearby. 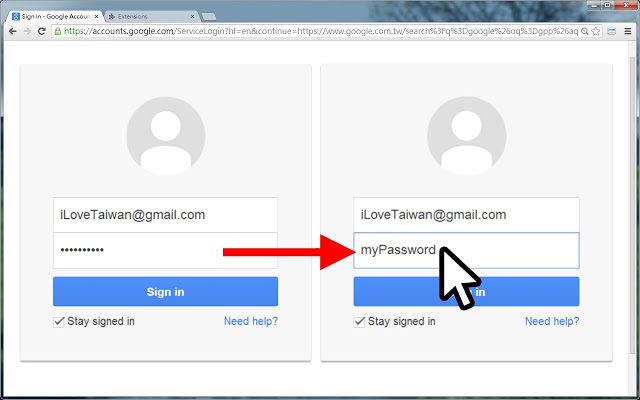 In short, with ShowPassword you can prevent the asterisks from appearing when entering passwords in Google Chrome. Its use is, and it is available for the one that is the most used browser worldwide. It is an open source tool. You can access the software from GitHub. An excellent opportunity for those who wish to check the code of this extension and see that there is nothing hidden behind it. Finally, I want to remember that it is always advisable to download this type of extensions from the official Google Chrome store. This is something that we must apply not only to this browser but to any other that we are going to use. It is essential to do this because in this way you make sure that you are installing software that has not been modified maliciously. In the case of Firefox, the situation is a bit more complicated due to the release of Quantum, which broke the compatibility with several previous extensions. 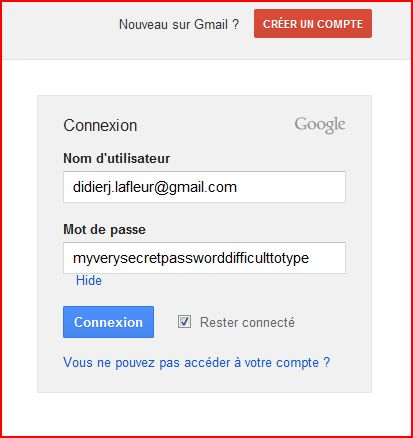 One that is working without too many surprises and has good feedback is Show/Hide Passwords by Didier Lafleur. I hope the weather improves in the future and the developers catch up with their extensions in Firefox. In summary, the idea isn’t to have to reach this point and maintain tight control over your passwords using a manager, but in an emergency, removing the asterisks can be very useful, and with this brief guide you know what you should do. Do you use another tool to show hidden passwords? Let me know in the comments section.